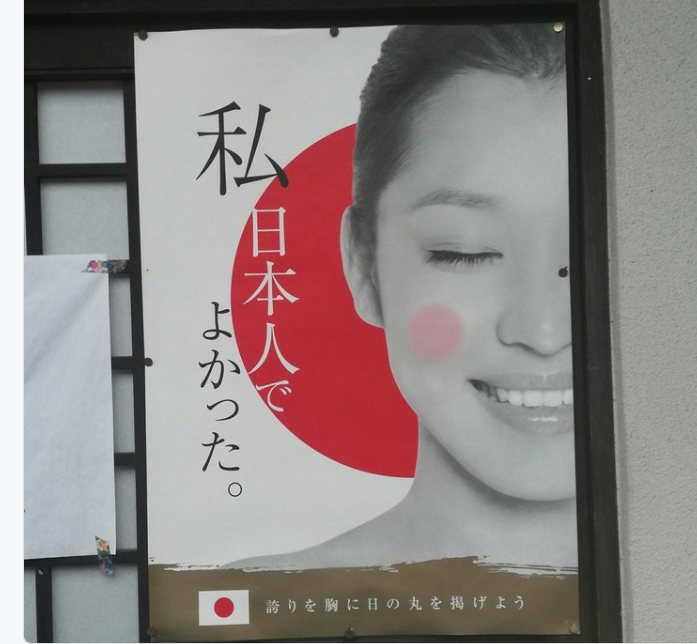 This old poster going viral online says, "I am proud to be a Japanese," but uses a Chinese model. A poster designed six years ago in an apparent bid to promote patriotism has recently gone viral on social media thanks to its catchphrase, which has revived public debate on race, and the revelation that its smiling model is actually Chinese. The poster, which a conservative religious group printed in 2011, features the face of a woman accompanied by the phrase: “Watashi Nihonjin de Yokatta” (“I am proud to be a Japanese”). It went viral in late April when a photo of it was uploaded on Twitter with a comment saying it had been seen at many locations, including a shrine in Kyoto. Since then, the tweet has been retweeted some 3,500 times. Several others on Twitter said seeing such a nationalistic poster made them feel uncomfortable. There are no clues as to who published it. Given that Kyoto is a major tourist city, one person said, “It’s offensive to foreign tourists” coming to the city. The whole issue took another twist last week when it was revealed that the woman featured on it was Chinese. “I presume people involved in the 2011 poster simply thought they needed a stronger phrase to grab people’s attention,” the official said, adding that Jinja Honcho prints similar posters once every few years as part of its regular campaign for the flag and has no plans to recall the 2011 version. Tokyo-based Jinja Honcho’s mission is to spread word about the endemic religion after the state’s sponsorship of it before and during World War II ended during the Occupation. The Allies were critical of how Shintoism was used to foster Japanese militarism and emperor worship. “Many who saw the poster (without any knowledge about who produced it) thought it a little strange and unpleasant that a weird propaganda poster could be seen at several Kyoto locations,” said Fumiaki Taka, an expert on ethnicity-related prejudices at the University of Tokyo. Japanese sometimes refer to themselves in a good light in order to differentiate themselves from other ethnic groups, and people critical of the poster have found the phrase used to be somewhat imprudent and “insensitive” to non-Japanese in general, Taka, 37, said. He was cautious, however, about immediately comparing the rise in interest in the 2011 poster with recent public concerns about Japan becoming less liberal and even more supportive of the patriotic sets of values adopted before and during the war. “The absence of any information about the creator helped develop disbelief and aversion” among people, and that helped the topic go viral this time, Taka said, adding, “I cannot say anything for sure” about whether recent sentiment in society, such as conservative tendencies, motivated tweeters to get busy about the topic. The photo of the woman used in the poster was distributed by Getty Images Inc. and many other agencies. A representative of Getty’s Japanese arm confirmed that the model was Chinese from her copyright-related document. “We don’t know why that happened. It was a long time ago,” the Jinja Honcho official said, referring to the decision to use a Chinese model rather than a Japanese for the pro-Japan poster. The tweeters seemed conflicted by the poster. 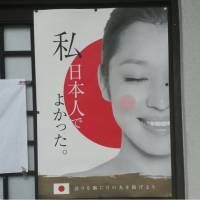 Some said the revelation about the model shows that nationalism in Japan is typically shallow, but others played it down and said the woman’s nationality has nothing to do with the poster’s message. Taka, who described the selection of the model as a hilarious “blunder,” suggested the disputes about the poster might serve as a wake-up call to those who turn inward and stick to narrow-minded nationalism. Japanese and Chinese have much more in common than what nationalists claim, and many things are closely intertwined in today’s world, Taka said, adding that the conflict between the catchphrase and the model’s nationality prove it.